We are calling all duly enrolled Tribal Members as the Yakutat Tlingit Tribe will be holding its annual Tribal Elections on November 13, 2018. The Kwaan Plaza Conference Room will serve as the venue for the entire day’s proceedings, which will open its doors at 10 A.M. for our Tribal Members to cast in their votes until as late as 6 P.M.
Two vacant seats are up for grabs as we will be electing two Council Members who will each be serving two-year terms. The Yakutat Tlingit Tribe and the Election Board are proud to introduce our candidates, namely Larry Bemis, Cathy Bremner, and Raymond Sensmeier, who demonstrated their keen interest to serve the Tribal membership body by fulfilling their declaration of candidacy before the end of the 12th of October. The Yakutat Tlingit Tribe and the Election Board are looking forward with great anticipation for this significant event, as each year we are endowed with the honor to welcome new members to our Tribal Council to aid in maintaining and advancing the policies and initiatives of our current leadership. Furthermore, it is indeed a delight to rest assured that regardless of the outcome of the upcoming elections, this change will lead to a more dynamic approach to leadership and develop diverse ideas, while heading in the same direction and working towards achieving the same goal and mission which is to spearhead the advancement of the social and economic welfare of the Yakutat Tlingit people and all Tribal members. Absentee ballots are available starting October 15th, 2018. Please head to the Yakutat Tlingit Tribe Main Office, located at the second level of the Yakutat Elementary School to fill out your absentee ballot form or feel free to call us at (907) 784 3238 and we can mail them out by request. Save the date. Vote Wisely! 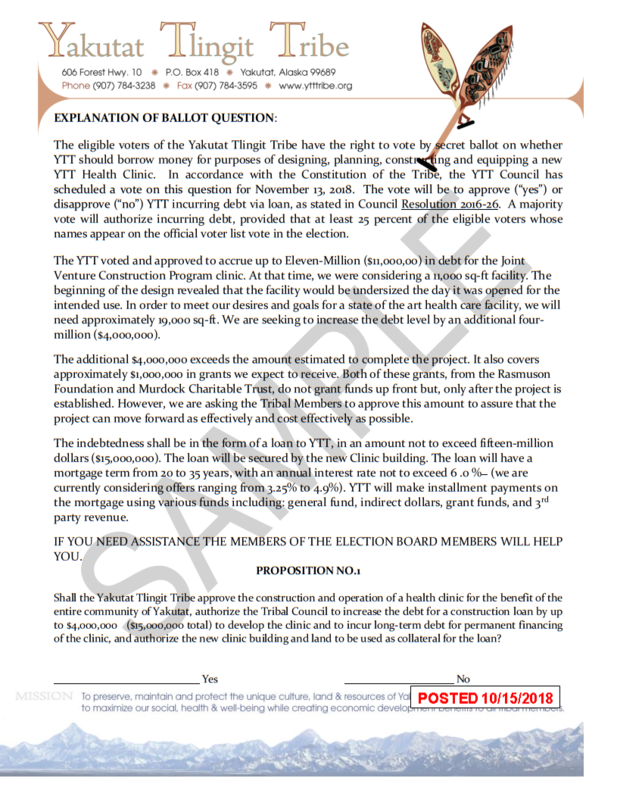 At the Annual Tribal Elections scheduled on November 13, 2018, eligible voters have the right to vote by secret ballot on whether YTT should borrow money for purposes of designing, constructing, and equipping a new YTT Health Clinic. The vote will be to approve or disapprove YTT incurring debt via loan, as stated in Council Resolution 2016-26. A majority vote will authorize incurring debt, provided that at least 25 percent of eligible voters whose names appear on the official voter list vote in the election. As opposed to the previously voted-upon and approved amount of $11,000,000 in debt for the Joint Venture Construction Program clinic which will build an 11,000 sq-ft facility, the beginning of the design phase revealed that the facility would be undersized for its intended use. In order to meet our goals for a state-of-the-art health care facility, we will need approximately 19,000 sq-ft. Therefore, we are seeking to increase the debt level by an additional $4,000,000. The additional amount covers approximately $1,000,000 in grants we expect to receive, both from the Rasmuson Foundation and Murdock Charitable trust – but these foundations do not grant funds up front, and only after the project is established. For that reason, we are asking the Tribal Members to approve this amount to assure that the project can move forward as effectively and cost efficiently as possible. The indebtedness shall come in the form of a loan to YTT, in an amount not to exceed $15,000,000. The loan will be secured by the new Clinic building. The loan will have a mortgage term from 20 to 35 years, with an annual interest rate not to exceed 6.0%. YTT will make installment payments on the mortgage using various funds including: general funds, indirect dollars, grant funds, and 3rd party revenue. We are encouraging all eligible voters to come out and vote on November 13, 2018 – not only for our Tribal Council Leadership, but also for the future of our healthcare!